McGill professor Ernest Rutherford is famous for his study of radioactive materials. He discovered the concept of the atomic half-life, studied radiation particles, and discovered the element radon. These investigations, conducted at McGill, won him the 1908 Nobel Prize in chemistry. Aside from Ernest Rutherford, two other McGill faculty members have received the Nobel Prize, and are often forgotten: Frederick Soddy and Otto Hahn. Both were collaborators with Rutherford at McGill in the early twentieth century. Frederick Soddy won the Nobel Prize in chemistry for his theory of atomic isotopes in 1921. 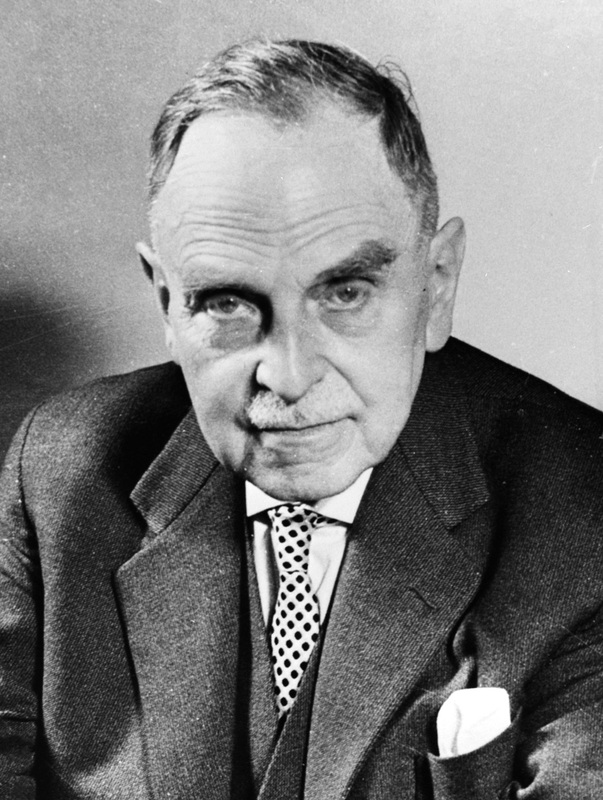 Otto Hahn won the 1944 Nobel Prize in chemistry for the discovery of nuclear fission, the process eventually used for atomic bombs. Hahn’s biography is also a window into 20th century history and that of the atom bomb. Although his work was not overtly political, his complicity was, as he developed chemical weapons in WWI, and quietly continued his nuclear research under the Nazi regime in WWII. He suddenly became politically active following the atomic bombing of Japan, after which he started campaigning against the proliferation and use of nuclear weapons. His life and work raise questions about the role of science in the public sphere, and the responsibilities scientists have as public figures. He learned through experience that the consequences of research can be difficult to predict or control. Hahn worked in Rutherford’s research team at McGill from 1905 to 1906. In his correspondence with Rutherford before joining the lab, Hahn claimed to have discovered a new “element” related to thorium (the theory of isotopes was not yet established), which he called radiothorium (later found to be the isotope thorium-229). Rutherford doubted those claims, but Hahn was quickly able to convince Rutherford and his team that he had discovered something new. While at McGill, Hahn tried to calculate the half-life of his “radiothorium”, and also discovered a form of actinium, an element now used in radiation therapies. After working at McGill, Hahn returned to Germany, where he began collaborating with Dr. Lise Meitner on the study of radiation. They focused on beta radiation – the emission of electrons (or their anti- matter twins, positrons) from radioactive elements. In 1911, Hahn became the head of the Department of Radiochemistry at the Kaiser Wilhelm Institute for Chemistry in Berlin. He was drafted during WWI in 1914 and earned an Iron Cross. After that, he became a chemical warfare specialist, and tested chemical weapons for the Germans at both the Eastern and Western fronts. His unit trained under Fritz Haber, a notorious chemical weapons researcher. After the war, Hahn returned to his nuclear research. In 1934 Hahn, Meitner, and Fritz Strassmann, another German chemist, began to investigate the products of uranium decay. Hahn and Strassmann posited, hesitantly, that uranium atoms split into two atoms as part of their decay process. Dr. Meitner and her nephew, Otto Frisch, confirmed the process, outlined the mathematics, and gave it a name that would soon become notorious: “nuclear fission.” Dr. Meitner, who was Jewish, fled Germany for Sweden in 1938, and Hahn helped her escape. Hahn and Strassmann continued their research and found experimental evidence that uranium, when bombarded with neutrons, produces barium and other lighter elements. Hahn continued his research during WWII, trying to explore and categorize the many different kinds of elements that arise from fission. As a primary researcher on the principles of nuclear fission, Hahn had developed the ideas which led directly to the creation of the atomic bomb. When a German research group was formed to investigate military applications of atomic power, Hahn was not included. While Hahn continued his research, thousands of scientists and intellectuals fled Germany for fear of the Nazi Regime. After the defeat of Nazi Germany, Hahn was imprisoned in England, along with many other German nuclear scientists, in a British attempt to learn about the Nazi atomic weapons project. The scientists were interned together near Cambridge when news broke about the bombing of Hiroshima and Nagasaki. In 1945, five weeks after the bombing of Hiroshima, Hahn was awarded the Nobel Prize for his discovery of nuclear fission. Hahn could not be present at the ceremony because he was still detained in England. He did not share the prize with either Lise Meitner or Strassmann. Meitner almost certainly deserved a share of the prize for her collaborations with Hahn for the duration of their research. In the team, she advocated for the theory that the atoms were “splitting.” Even after she had fled Germany, her experimental results in Sweden were crucial to supporting a the theory of fission that Hahn himself was reluctant to propose. Meitner joined the likes of Rosalind Franklin, whose diffraction images of DNA directly inspired the double helix theory accredited to Watson and Crick, and many other women overlooked by the Nobel Prize Committee. When Hahn returned to West Germany he was elected president of the Kaiser Wilhelm Society, renamed the Max Planck Society after the war. These research institutes remain prestigious today. He used his position in the scientific community to campaign against the proliferation of nuclear weapons. He became a well- regarded public intellectual, receiving many national medals and honors including fellowship in the Royal Society of London, the French Légionne d’Honneur, and the American Fermi Award, which he shared with Strassman and Meitner. Discussion of Hahn’s life has often centred on the Nobel Prize controversy. His complicity with the Nazi Regime, on the other hand, has often been overlooked or ignored. Hahn developed chemical weapons during WWI, defended the Nazis in WWII, and received a Nobel prize that overlooked Meitner’s part in their shared discoveries. He seemed content to ride the wave of political change in Germany under Nazi Rule, until his own discovery was used to kill thousands in Japan. Speaking up against nuclear proliferation in West Germany won Hahn prestigious international honours. However, his complicity in the Nazi Regime to achieve these accolades force us to question the objective value of these scientific achievements, and to examine the ethical responsibilities we have as scientists. We have a responsibility to ensure that our discoveries arrive in a society that will use them justly and to benefit all people. As scientists and researchers, we often feel that our work has minor significance outside the lab. Research, in most cases, is carried out with the intention of expanding knowledge for the betterment of society. Working from the confines of the lab, applications of research can appear distant and benign. Hahn’s life should serve as a reminder that knowledge is difficult to control after it leaves the lab. The effects of discoveries are unpredictable and, sometimes, horrible. For this reason, scientists have a responsibility, beyond that of ordinary citizens, to speak up against unjust political structures and violent aims. Hahn gained social status and influence from his research, and his moral detachment and inaction towards the Nazi regime is a grave failure. His later activism against nuclear weapons seems to attempt to rectify this type of failure. However activism after the fact is of little to no consequence and does not excuse a life of complicity. People who unlock terrible power through science are not always virtuous themselves. Often, these scientists are as morally detached as the forces they discover, no matter how many foreign orders, medals, and awards they win. As student researchers and future scientists, we have a responsibility to ensure that our discoveries arrive in a society that will use them justly and to benefit all people, and to be aware of their potential uses- both beneficial and harmful. We should not wait until late in life to discover that responsibility, and we must speak up against grave injustices, whether we are directly complicit or not.